This phenomenon has been well-documented, most recently in David Friedman’s Wilde in America (2014) which portrays Wilde as being so intent upon fame that he had a strategy for achieving it—a view with much validity. 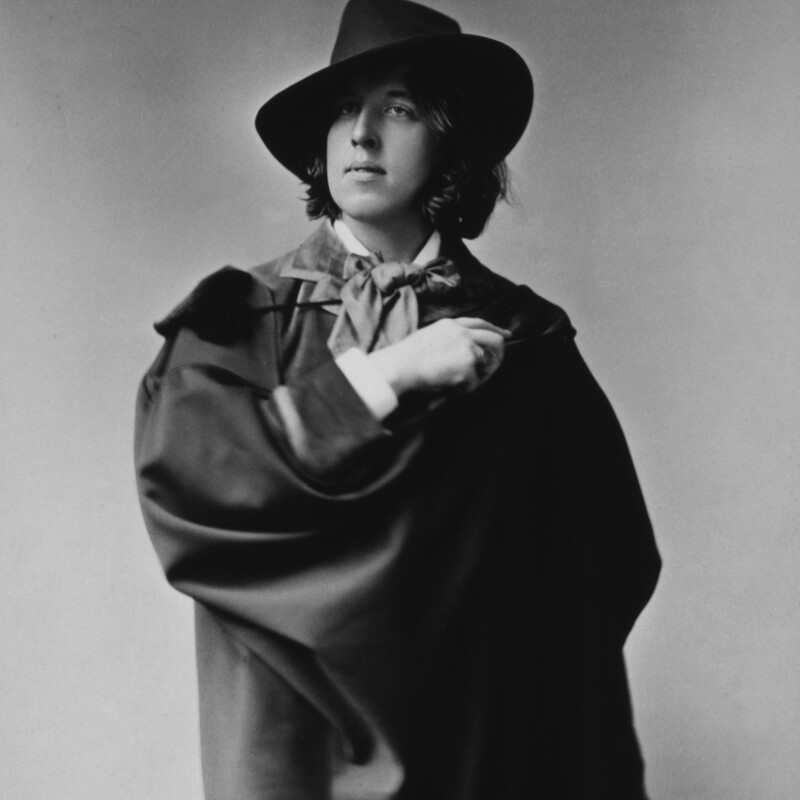 Whatever Wilde’s personal strategy was, however, he was compounded in the effort by his own tour publicity, the popularity of Gilbert and Sullivan’s Patience and its burlesques, and a general curiosity of the people to see him. As a result, one might wonder whether it is possible to be too ubiquitous. Take the world of advertising. 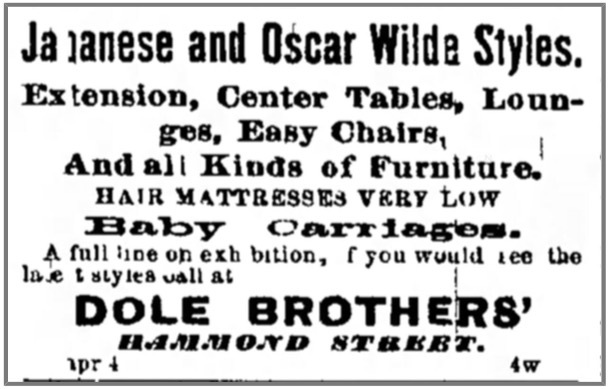 Wilde was so famous on his American tour that his name was used by advertisers to generate media exposure for products with which he had no connection. 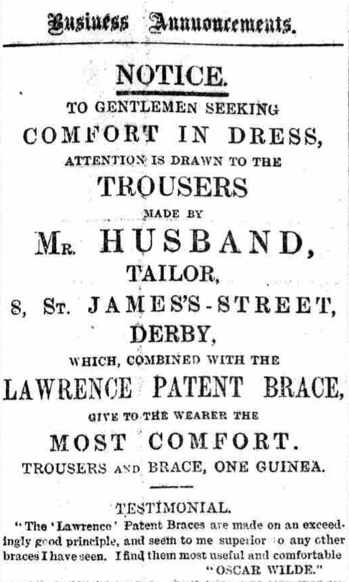 They include imaginary Wildean associations with suits, trousers, hats, neckwear, linens, collars and collarettes, and shoes. But his name was not just good for clothing. He could be found puffing everything from coach varnish, Easter cards, stationery, plant seeds, straw goods, plumbing goods, curtains, baby carriages, baseball, and even bosom beautifiers and veterinary skin cures. Finally, there is a poem that defies any rationale for Wilde’s name in its title. 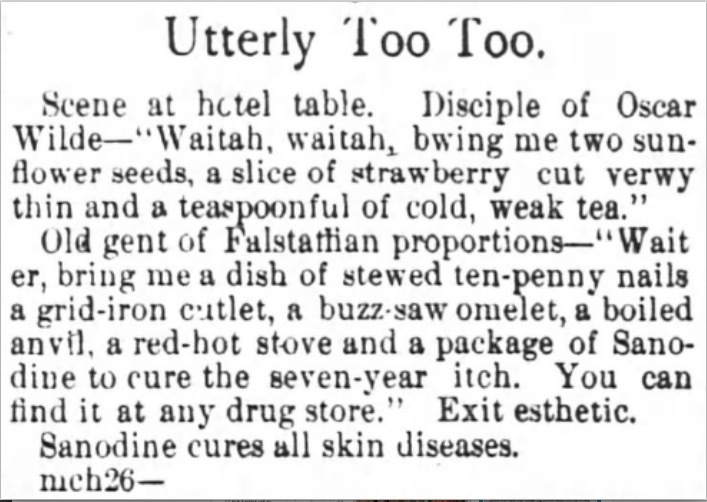 It is a measure of true fame (or possibly Wilde’s simultaneous notoriety) that advertisers sought not only to suggest an Oscar Wilde connection to their products but also to deny it! 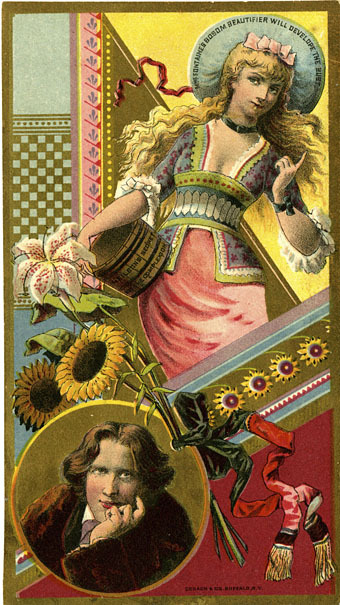 This latter phenomenon is evident in the first five of the following advertising ephemera, all of which date from 1882. I do recall flipping through a lot of this. Hardly a Mad Man era in advertising. Had they employed Oscar as a copywriter the results would have been decidedly more memorable. Agreed. I’d probably agree even more if I’d ever watched Mad Men. But just imagine how much Oscar would have made in endorsements. Did Wilde take all this to heart? When he set out to conquer Paris, he abandoned aesthetic dress, gave no lectures and was the subject of no shoes, shirts or hats. He wanted acceptance by Victor Hugo, Zola, Mallarmé, not by cartoonists. Perhaps we have been too mesmerised by the ‘being talked about’ quip. 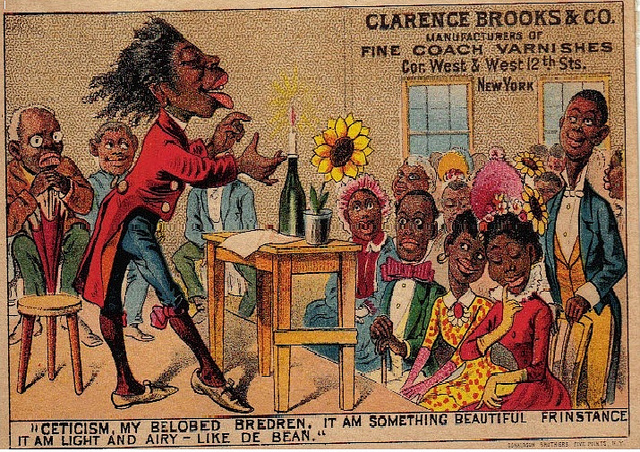 With the ‘being talked about’ quip Wilde was commenting on the enigma of fame and obscurity: unequal states that are almost equally undesirable. But I agree, there is a danger of being mesmerised by Wilde’s meaning: conflicted characters can be at their most seductive when being paradoxical. To cut through this, I would not wish to imply that Wilde coveted the attention of cartoonists—although he no doubt recognised its value. 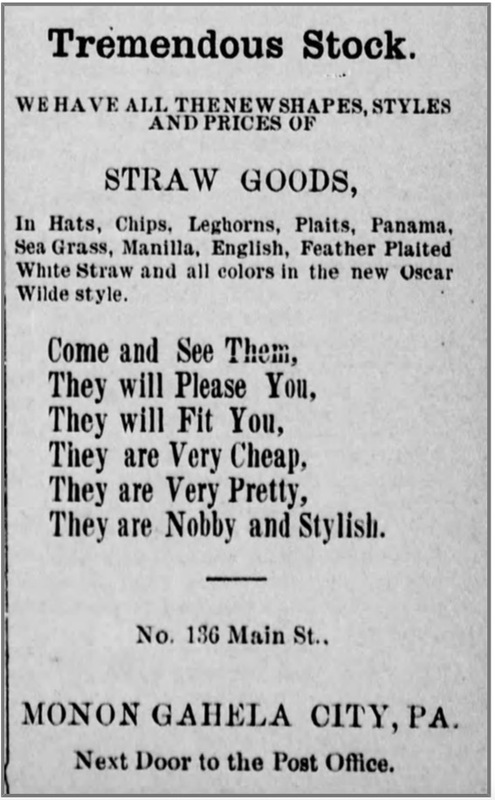 I’m sure he appreciated that his infiltration into advertising copy, along with his long hair and costume, were related products of his American tour of 1882. 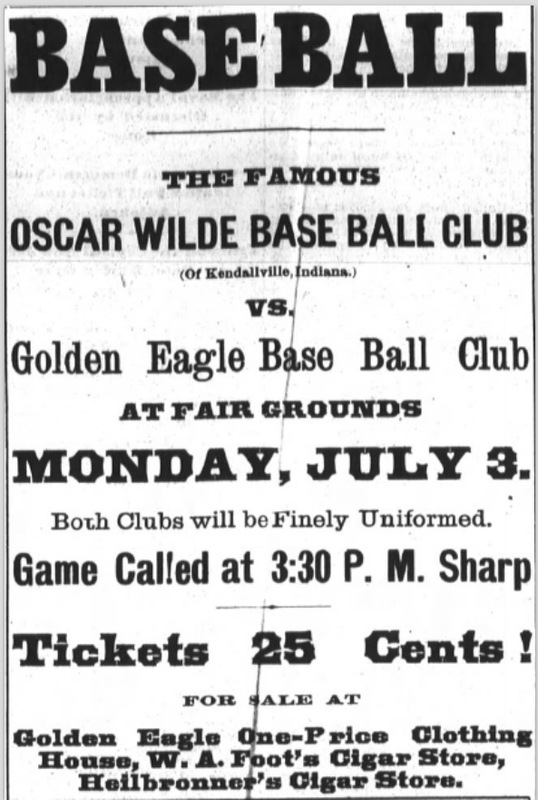 He said the Oscar of the first period ended thereafter, so you’re right to remind us that his motives and reception changed in early 1883. He probably wished (a la Lewinsky recently) to ‘reclaim his narrative’ by transitioning from public ridicule to personal acceptance. So the answer to whether Wilde took all this to heart is fittingly elusive because his time in America was simultaneously atypical and formative. Ah but. I was citing the recent Ms Lewinsky. She’s a new woman and self-determinist in her TED talk, here. Worth the time. I love the “This is Not Oscar Wilde” ad. And by the way, I once wrote a blog post on Monica Lewinsky and Lord Alfred Douglas.